IRCTC (Indian Railway Catering and Tourism Corporation) handles most of the services of Indian Railways including catering, tourism, and online ticketing operations. Along with this, they also provide the option to cancel tickets. Open your web browser and head over to “https://www.operations.irctc.co.in/ctcan/SystemTktCanLogin.jsf“. Enter your PNR Number and Train Number along with Captcha in the provided boxes. Check the provided box to confirm that you have read the rules and regulations. Once you have clicked on submit, an OTP (One Time Password) will be sent to the mobile number which was provided at the time of booking. Enter the password that you received through SMS and click Submit. Once the OTP is validated, PNR detailed will be displayed on the screen. Read the details and verify them. 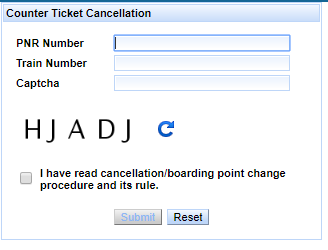 After verifying the details, click on “Cancel Ticket” for full cancellation of your ticket. The Refund Amount will be shown on the screen. For tickets which are cancelled 24 hours before the departure time of the scheduled train, Refund Amount can be collected on submission of original PRS counter ticket from any PRS counter of Indian Railways up to 4 hours before the departure of the train in case of confirmed tickets and up to thirty minutes before the departure of train for RAC/waitlisted tickets. For tickets which are cancelled between 24 hours and up to 4 hours in case of confirmed tickets and up to thirty minutes for RAC/waitlisted tickets before the scheduled departure time are only permitted refund at the journey commencing station or nearby satellite PRS locations by handing over the original journey ticket. ← How to find out trains affected by Fog?